Co. Fermanagh: Ballycassidy, Ballyreagh, Carn, Castlecoole, Clabby, Ealy (2), Enniskillen (4), Florence Court (2), Holywell, Kinawley (2), Laragh, Letterbreen, Manor of Carrick (2), Rahalton, Tempo. Co. Cavan: Glen, Killinagh (2), Swanlinbar (2), Tullynamoltra (2). The population falling within the Union at the 1831 census had been 68,694 with divisions ranging in size from Clabby (population 1,601) to Enniskillen itself (8,367). The Board also included 10 ex-officio Guardians, making a total of 40. The Guardians met for the first time on 21st September 1840 at the Enniskillen Courthouse. The first officers to be elected were the Hon. John Cole as chairman and Simon Armstrong as vice-chairman. Paul Dane was appointed clerk. The meeting was also attended by Poor Law Commissioner Otway from the central Poor Law Commission office in Dublin. Otway attended many subsequent meetings, reporting back to his superiors on progress in the union and the conduct of the Guardians. 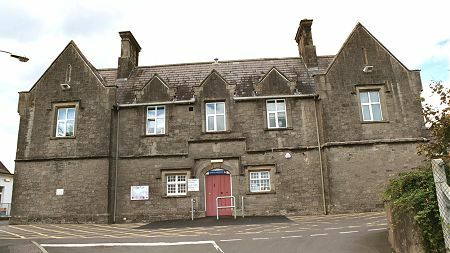 The new Enniskillen Union workhouse was erected in 1841-3 on a 9.5-acre site at Cornagrade to the north-east of Enniskillen on the north bank of the River Erne. Until 1846, no proper road existed to the workhouse and it had to be reached by ferry. Designed by the Poor Law Commissioners' architect George Wilkinson, the building was based on one of his standard plans to accommodate 1,000 inmates. Its construction cost £8,750 plus £1,415 for fittings etc. The buildings followed Wilkinson's typical layout. An entrance and administrative block at the south-east contained a porter's room and waiting room at the centre with the Guardians' board room on the first floor above. Enniskillen entrance block from the south-east, 2003. 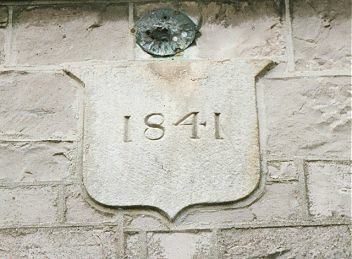 Enniskillen entrance date plaque, 2003. 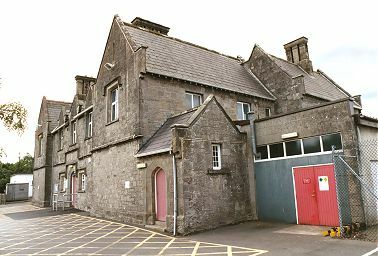 Enniskillen entrance block from the east, 2003. The workhouse was finally declared fit for the reception of paupers on 19th March 1844 and admitted its first inmates on 1st December 1845. The first master of the workhouse at a salary of £40 per annum. The first matron was Mrs Mary Blakeley (£30 per annum), and the first medical officer was George Nixon (£60). Initially, the inmates' diet was potatoes and milk three times a day. With the onset of the famine soon after the opening of workhouse, pauper numbers rose and this already very basic diet was reduced. Potatoes were removed from the menu in August 1846 and the inmates fed on buttermilk and stirabout (maize mixed with water or milk). However, following instructions from the Poor Law Commissioners, rice and soup were added. In March 1847, supplies of tea and sugar, purchased for the workhouse, were found to have been sold off by workhouse officials for their own gain. Conditions in the workhouse deteriorated and in May 1847, a total of 156 inmates died in the workhouse. To save money on burials (typically 1/6d or 2s. per body) part of the workhouse were set aside for use as a burial ground. However, the number of deaths was so great that this soon became full to overflowing with bodies piled up in mass unmarked graves. During the famine, a hired house and sheds were appropriated to accommodate 120 fever patients. A fever hospital was erected at the south of the workhouse and opened in October 1849. Because of the fever, the Guardians moved their weekly meetings from the workhouse to the Enniskillen Town hall. After the famine, the union was heavily in debt but gradually recovered. Inmates were put to work around the workhouse and in the town, and vegetables were grown to make the workhouse more self-sufficient. There was also a decline in admissions to the workhouse and a gradual increase in the poor rates which financed the union. At the 1901 census, the population of the Union was 31,140 with 203 inmates in the workhouse. The Board of Guardians was finally abolished in 1948 with the advent of the new National Health Service. The Guardians had their final meeting on September 3rd 1948 and the remaining 30 inmates, comprising children, old people and unmarried mothers, were transferred to Armagh workhouse. The workhouse became a general hospital then was largely demolished in 1964 to make way for the new Erne Hospital. Only the original workhouse entrance block now survives. Public Record Office of Northern Ireland, 2 Titanic Boulevard, Titanic Quarter, Belfast BT3 9HQ. Holdings include Board of Guardians' minutes; Workhouse registers (1845-1901); Indoor admissions and discharges (1931-41); Indoor relief lists (1927-47); masters' journals (1913-48); Porters' books (1885-1948); Chaplains' book (1845-1950); Tobacco books (1938-48); Return of births (1885-1899); Return of deaths (1905-48); etc.